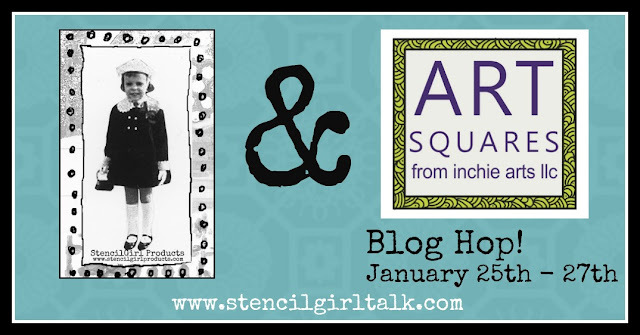 What happens when Maria plays with StencilGirl stencils and Inchies? Gwen is making mini art journals! Dina's embossing stencils onto her Inchie art squares! Take your time and visit each blog showcased today through Wednesday and leave a comment. You will have until Saturday, January 30th at 11:59PM Central Time to leave your comments. StencilGirl's Facebook page on Sunday, January 31st. More beautiful offerings. Off to investigate further. What a wonderful hop. Such unique and beautiful art created here. It is so nice to have all this versatile inspiration to carry back to our own projects. I have a nice collection of SG Stencils and am looking at them in a whole new way! Loving all the projects and inspiration!!! Such fuN!! Loving all the inspiration! Off to Hop! Looks like fantastic ideas. Off to hop. People do amazing things! So pretty! I love the mini art journal!!! thanks for the chance to win the prize - love the projects! I had no idea I would enjoy this hop so much. Wonderful inspiration. Wow, I mean, you had such great artists on the hop this time, WOW! The butterfly design is amazing. I love the little books that were made. Dina's impression was cool. Love all of the different ideas! Thank you for sharing.